The film tells the story of Carmel (Kim Chiu) who is desperate to save her grandmothers house from being demolished. She enlisted the help of her best friend Jerald (Ryan Bang) along with their other friends Bagang (Pepe Herrera), Ponzi (Lassy) and Basha (Moi Bien) by posing as ghost busters when they actually scam people for their money. Due to their many victims people are more aware of their tactics causing them to lose costumers. One day, rich and handsome bachelor Jack Colmenares (Enzo Pineda) enlists their help to exorcize his house of the many malevolent ghost. Despite being scared of continuing the job Carmel accepts it due to a large sum of money promised to be paid by Jack if they are successful. Carmel soon learns the horror truth hidden from her. This movie is Ryan Bang’s debut as a major lead after starring on several movies as the main characters side kick. This film is also his 2nd collaboration with Mayward Tandem. This film is also Mayward’s 2nd major film. 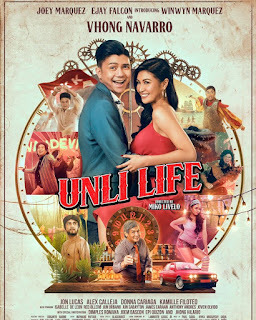 The film offers us a strange yet comedic tandem between Kim Chiu and Ryan Bang. It also gave us the much loved Mayward Tandem and a charming appearance from Enzo Pineda. The film features a few comedians that are sure to give us a laugh. The One That Ghost Away offers us a slight tone of horror but a major tone in comedy. For the many horror and also comedy lovers be sure to catch this new film in cinemas near you.